From the public baths of Mohenjo-daro to the luxurious individual models, bathrooms have come a long way. As we continue to evolve, so do our tastes and preferences when it comes to the comforts of the home. This article discusses the latest trends in bathroom remodeling; we hope you will find at least one idea that you absolutely must try! It could be the fact that bathtubs waste more water or that busy lifestyles do not allow lounging in one, so why have it in the first place or even considering them too expensive, bathtubs are on their way out. The money and space can be allocated to something else that has more utility. A shower, perhaps? There still exist bathtub lovers and they are not ready to give them up just yet. For those who still love the bathtub, in 2015, stand-alone tubs that save space will be the “it” thing. Options like the spa-jet tubs and serene soaking tubs are present. A busy schedule means popping into the shower more often than soaking in a bathtub for hours. If you are not taking baths, you probably do not need a bathtub. This frees up a whole lot of space for a shower that can be as ginormous as you want it to be. Walk-in or doorless, curb-less and no-threshold showers are just some of the luxuries that you can sample while accommodating this trend. A staggered pattern of 12-inch by 24-inch rectangular tiles on bathroom floors and shower walls will make for a smooth flow throughout the room. They do not swell when wet or need refinishing like wood does. Feature floor tiles add style to a bathroom without overwhelming the available space in smaller bathrooms while bringing elegance to larger ones. These stunning tiles provide a great design opportunity for challenging bathrooms with no clear walls to be made into a feature wall. Gray has become the new neutral and the new beige. Consumers are tiling everything gray –from their kitchens to bathrooms. The trick is to pick a gray that is earthy rather than cold or sterile. A splash of bold colors will work ideally to accent the neutral. The secret to the tile’s growing popularity is in radiant floor heating. Once only available to high-end clients, it has now become more mainstream. Residents of areas that are cold for much of the year are thrilled at the idea of not having to walk around on cold tiles. The current remodeler’s bag of tricks is chock full of intelligent solutions for the modern bathrooms. Given below are some of the trends that are hot for this year. 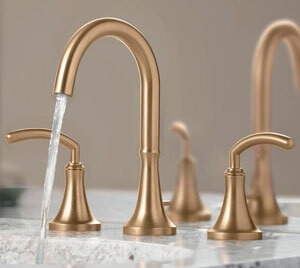 Chrome, brushed nickel, and oil-rubbed bronze – different warm coppery, brassy, and bronze-y colors are in this year. Out with the plain old stainless steel to explore the interesting possibilities. Low-flow and dual-flow toilets not only save energy but are also cost-efficient. People want to be smarter about water control. Thermostatic mixers, multiple-use mixers, and touch screen-operated showers are also in high demand. Double showers used by more than one person can benefit from multiple mixers. A his-and-hers double-sink vanity or two-sink vanities for bathrooms shared by siblings are just two examples of the customization that people now want for vanities. Mass produced is out and tailor-made is in! LED lighting is being used almost everywhere – in the bathroom, in and under cabinets. We hope you found one or two ideas in this article that you will want to try out when considering a bathroom remodeling project, or planning your new custom home. 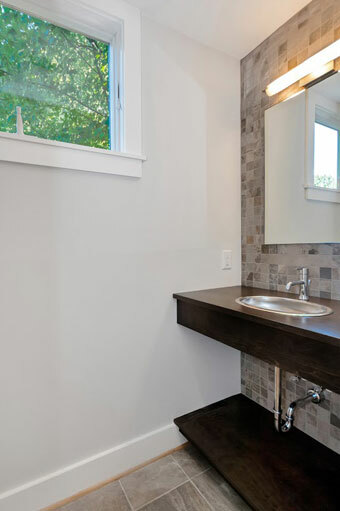 Give Weston Construction a call to discuss your next bathroom remodeling or new home building project. We will be happy to accommodate you! 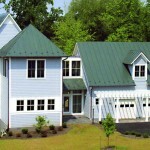 Weston Construction is a General Contractor in Charlottesville, Virginia with more than 20 years experience building new homes and renovating historic properties.